To keep you informed, here is a complete listing of available New London Engineering product catalogs. For additional printed copies, contact your New London Engineering representative. The General Catalog is a summary of New London Engineering’s complete conveyor product line. This 12-page catalog includes photos and general information about each conveyor and conveyor category. UPtime Express™ is New London Engineering’s extensive Quick Shipment Program offering a wide variety of conveyors that ship as quickly as 24 hours to a maximum of 10 days. 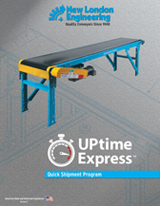 This 8-page UPtime Express™ catalog features all products and options available in the Quick Shipment Program. The ToughTrak™ catalog is a detailed summary of both the Model 150 and the Model 250 low-profile conveyors. This 12-page, fold-out style catalog includes photos and drawings of all drive locations, features and benefits of ToughTrak™, load capacity charts, and other useful low-profile conveyor information. Click here to download a pdf of the catalog. 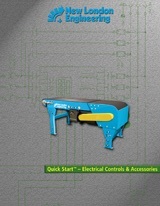 This catalog is a summary of all of New London Engineering’s metal handling conveyors. This 6-page, fold-out style catalog includes photos and comparison charts of each metal handling conveyor, drawings and definitions of common hinged steel belt options, TruTrak flanged roller drawings, and other useful metal handling conveyor information. The PlastiTrak™ catalog is a detailed summary of both the Model 1000 and the Model 2000 plastic belt conveyors. This comprehensive 20-page catalog includes conveyor photos and drawings, common belt/chain photos and application charts, model comparison and benefit charts, and other useful plastic belt conveyor information. Diebel/Link Series Belt Conveyors are designed to offer an economical method of transporting small oftentimes lightweight products. The overall profile is compact and the small diameter end rollers provide easy parts transfer from one conveyor to another. 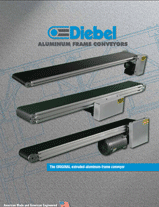 Options such as adjustable guide rails, sensor brackets and transfer plates are available to make Diebel conveyors a ready to use component of your automated systems. The Automation Series is a low-cost alternative to the aluminum frame conveyors currently on the market. These flexible, reliable, affordable conveyors are engineered for high-speed and highly automated assembly lines, automation cells, and packaging lines.